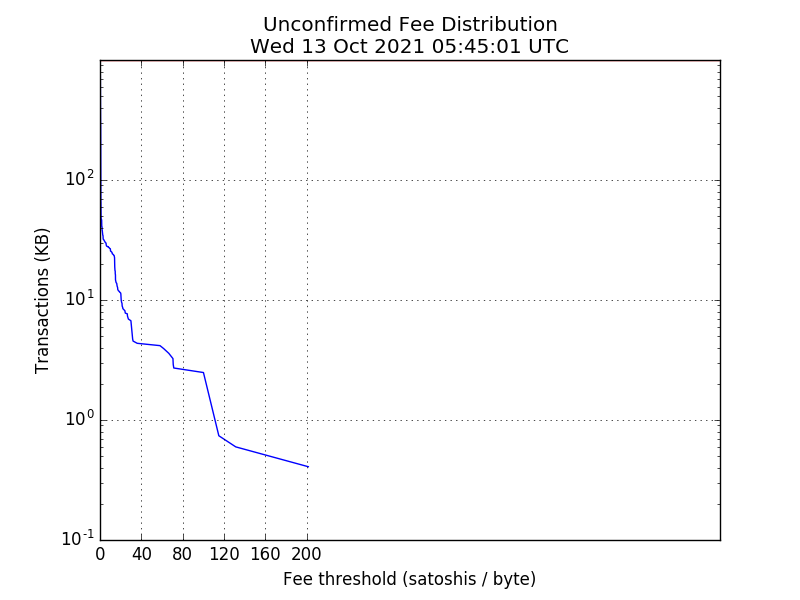 The image above shows the current distribution of fees in unconfirmed transactions. This can be used to estimate the fee required for inclusion in a block of certain size. For example, if a block were found now of size 1000kB, the minimum fee per KB would be directly below where a horizontal line at 1000kB crosses the blue curve. This assumes a profit-optimizing miner with the same set of transactions in their mempool as what our Bitcoin Core node reports. * The estimates shown above are for a 373-byte transaction which is one that spends two outputs and creates two, one for the recipient and another for change. This is the larger of the most common transactions seen on the network. Please consider the size of your transaction and multiply it by the fee/kb in the table above to optimize the fees you pay. Realize also that the mempool on our node and others doesn't necessarily represent the network or what is likely to be mined in any block.